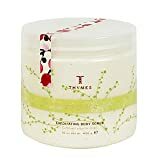 "Inspired by Art, moved by nature, grounded in nature..." Bath and Body, natural products and essential oils...Thymes was created for hardworking women to help them feel rejuvenated, refreshed and optimistic! What woman wouldn't want that?!?! And, Thymes is made in MINNEAPOLIS!!!! So cool..right? My home city. I have been spritzing myself with this Wild Ginger Cologne. I personally love the smell of ginger. It's comforting yet rejuvenating. It has a very light ginger smell and the scent lasts a long time on. This fragrance not only has ginger it has cucumber, vanilla , a little Tahitian lime and Moro orange. YUM. Can you say relaxing? It's fresh yet spicy and it's price is only $32. This will be a scent I will wear for many days to come. Another 2 products I have been using are: the Olive Leaf Body Wash and the Red Cherie Sugar Body Scrub. My husband and I have both enjoyed these body products. They are GREAT in the shower. I feel like I am using a luxury wash when I use these. The olive leaf wash is lightly herbal, and the clear gel slightly suds. It SORT OF reminds me of a scent I would get in a luxury hotel. Great for both men and women. The Red Cherie sugar scrub has a smell that would be intoxicating to anyone. As soon as you dig into the sugary scrub a cherry smell hits you , sweet and refreshing. The sugar is so thick...this body scrub is the most dense scrub I have ever used. I would recommend using a washcloth to scrub this on. I also was using it to exfoliate my face and when I rubbed it by my lips it was sweet! :-) I wouldn't recommend tasting this...but it is sweet, so it definitely contains sugar. The fragrance also has pomegranate, passion flower, lychee and a fruity musk. Love this. These would both make GREAT gifts for any woman. They are $18 for the body wash and $28 for the scrub. You can purchase these items or read more at www.Thymes.com :) Enjoy! They have LOTS of products and I would assume most scents are lovely. I also have been working with 2 products from a company called Pur Minerals. Pur Minerals is a make-up and skin care company I had heard of before. The first product I ever received was a bronzer. It was in a giveaway bag at a thing I did as a promotional model. The primer is on the left and eye cream on right. First, I tried the eye cream -Tone up. I have only used a few eye creams or serums in my time... and I am 23 , so...my eye situation could be worse. I don't have dark circles or wrinkles...But, I can tell you what this is doing for me. The correcting primer is so silky. It's not sticky at all and makes my face feel powdery soft. I tend to not wear primer that much just because my skin is (pretty) smooth as it is...(not to say it's perfect), but I usually use primer on someone who really wants a super smooth looking appearance. I would recommend this to someone who has larger pores and oily skin. I have used some other brands' "face primers" before and I do like this one because it goes on completely transparent and has no smell or shimmer. It just feels like a very velvety moisturizer going on. (I'm sure if you felt it...you'd love it!) This is priced at $31. That is also pretty reasonable for a primer. It's not real cheap..but in my opinion it's not overpriced. Disclaimer: I received these products from the company for reviews...but was not paid for this blog. These reviews were on my own terms and are my honest opinions. Remember to look below for my Giveaway!!!! The contest is up this Saturday. You can check out the rules on my blog post below!